Debt caps as proposed in House Bill 553, the IDEA Act. HELENA — A Republican plan to give Montana a more reliable process for funding state buildings, rural water systems, and other infrastructure projects took a step forward last week as a legislative committee reviewed a proposal designed to guide infrastructure policy in the future. House Bill 553, known as the Infrastructure Development and Economic Accountability Act, also limits how much debt the state can take on at once. The IDEA Act passed its initial legislative hurdle with bipartisan support Feb. 22, earning a unanimous endorsement from the House Appropriations Committee after its initial hearing. Montana has several cash-funded infrastructure programs that generally have bipartisan support, but the Republican-controlled Legislature and Democratic governors have clashed in recent years over proposals to do additional projects using bonding, whereby the state borrows money by issuing bonds that are paid back over time. Bonding bills, which take a two-thirds supermajority to pass, have been voted down in each of the three prior legislative sessions in 2013, 2015, and 2017. Moore said the IDEA Act’s debt limits create a framework that will allow the state to bond for infrastructure more responsibly. He’s hoping that’s enough to win over conservative legislators in his party who have historically opposed bonding measures as a matter of principle. 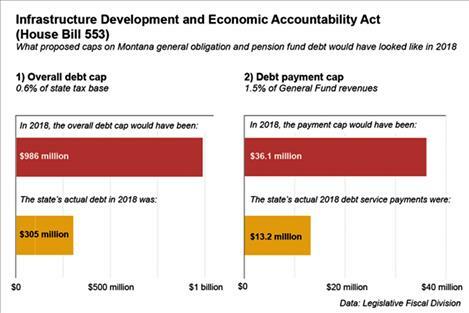 As proposed, the IDEA Act contains two constraints on Montana’s state-held debt: 1) an overall cap limiting general obligation and pension fund debts to 0.6 percent of the state’s property tax base, and 2) a payment-based cap limiting the state to spending 1.5 percent of its general fund revenues on debt service, or money used to pay off bond-based loans. “If we hit either one of those triggers, just like a bank would, we’re going to say, ‘We don’t get to borrow any more,’” Moore said. After several sessions in which no bonding legislation passed, Montana currently has fairly low debt compared to other states. According to figures provided by the Legislative Fiscal Division, the IDEA Act’s overall cap would have amounted to $986 million in 2018, when the state owed a total of $305 million. That year the state spent $13.2 million in payment on its existing loans, roughly a third of the $36.1 million payment cap that would have been in effect under the bill. This year, Gov. Steve Bullock has proposed a $440 million infrastructure package including $160 million in bonded projects that would create debt subject to the proposed cap. Among the projects are a new Montana Historical Society building and renovations to Montana State University’s Romney Hall. The governor’s office hasn’t said whether it thinks the debt limits in the IDEA Act proposal are appropriate. Moore and other legislative Republicans have said they’re drafting a project list bill of their own as a counter to the governor’s proposal, but haven’t yet announced details. The IDEA Act itself doesn’t appropriate money for projects. Rather, it specifies how the governor and legislators will decide which projects to fund in future years. As is the case with a number of existing state infrastructure programs, the act would have the governor develop a list of projects recommended for funding, and then pass that on to the Legislature for approval during biennial legislative sessions. The measure also includes language designed to ensure that the state sets aside enough money to maintain existing public buildings. Combined, Moore said, those changes will help Montana do a better job managing its infrastructure without taking on too much debt. He said that Utah, which has a similar system in place, has better bond ratings than Montana despite holding more debt — meaning financiers consider Utah’s bonds a safer investment and will generally offer the state better interest rates on loans. Moore said the bill, which needs to pass the Montana House before the March 2 deadline for transmitting non-appropriation bills to the Senate, will likely be heard on the House floor this week.